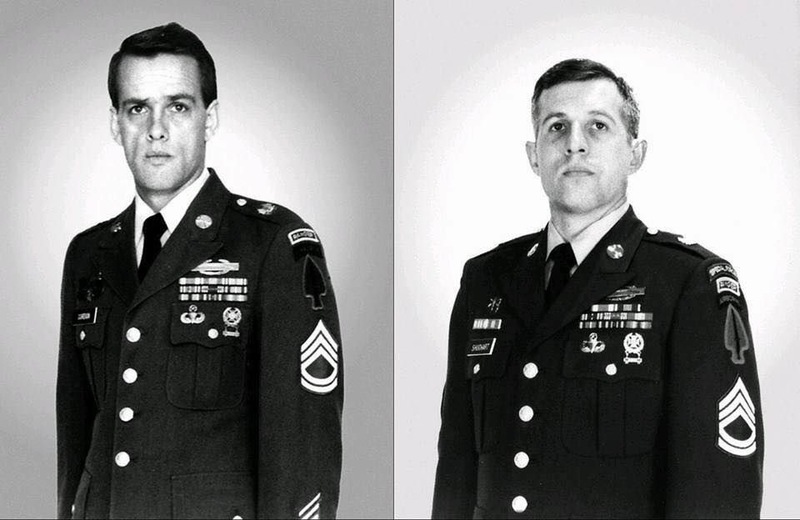 25 years ago this afternoon, 33-year-old Gary Gordon (left) and 35-year-old Randy Shughart (right), both members of the Army’s 1st Special Forces Operational Detachment Delta, were providing air cover for Rangers in Operation Gothic Serpent in Mogadishu when a fellow Blackhawk helicopter was shot down. Gordon requested to be landed at the crash site to provide cover for the crew, but was denied permission. Seeing the hostile Somali crowds converging on the downed Blackhawk, he pressed his request until finally granted permission. Gordon and Shughart, armed each with only his own rifle and pistol, were dropped off at the crash site, and found pilot Michael Durant alive. There they formed a perimeter around him hoping for rescue that never came. Both men exhausted their ammunition and were killed saving Durant, who was taken alive as prisoner. Both men were posthumously awarded the Medal of Honor, the first ones awarded for action since Vietnam. Today we honor their memory! Copyright © WarHawgs | All Rights Reserved.